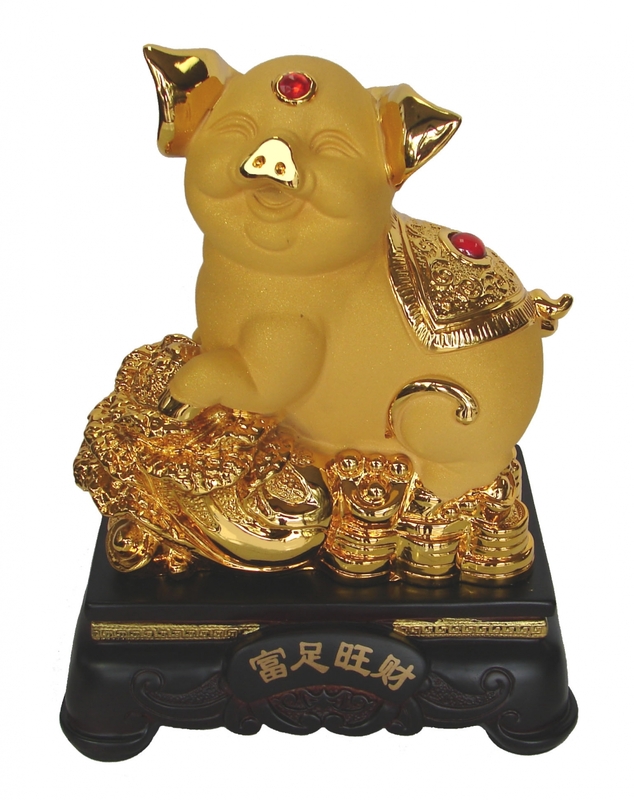 Featuring of bai choi, Chinese coins and ingot, this 8" beautiful rubber finish golden pig statue symbolizes wealth and good luck. Having such beautiful golden pig statue at home to booth wealth and business luck for Chinese lunar year of pig. Bai choi, which is also known as bok choy, bai chai, is a powerful symbol of wealth and opulence in Chinese art, literature, and culture. This unique vegetable's name "bai chai" can also be pronounced as "hundred wealth," and is said to have powerful abilities to boost wealth, business luck, and fortune. The Chinese words on the stand are "Fu Zhu Wang Cai" that stands for Prosperity Pig Booming Wealth.